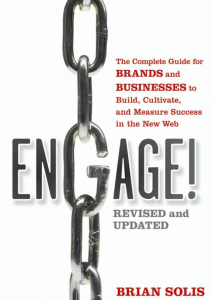 If you just bought the original Engage, don’t worry, this book doesn’t replace it. Engage 2.0 is a different book with a different purpose. When it came time to release Engage in paperback I was asked if there were any changes I wanted to make before going to press. The answer was an emphatic yes. I took this opportunity not because I felt there was anything wrong or missing, I just saw a chance to practice what I preach. As such, I listened over the year to Tweets, posts, and reviews and felt the need to incorporate suggestions and requests for a different take on an important subject…engagement. In this second edition, I cut approximately 35,000 words and 40 sections from the original. To put that in perspective, that’s over one-half the length of a standard business book. I also took the opportunity to add new sections and also introduce significant updates to each chapter. The end result is that Engage 2.0 delivers a focused approach to help strategists and executives craft, execute, and measure meaningful and effective social media engagement programs.